Special Containment Procedures: SCP-485 is to be kept in a locked safe-deposit box at all times with the key to be kept in a secure location. 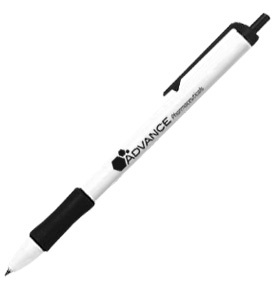 Description: SCP-485 appears to be a standard retractable pen with an unusually easy to click button. The pen itself was accidentally stolen by Dr. Dahij, upon renewing his life insurance policy. The pen once belonged to Agent ████████ of ████ Life Insurance Inc. Each time the pen's tip is extended, a random person known to the user dies by an unknown cause. Since the button's action is abnormally smooth, subjects during testing were noted to rapidly click the pen without conscious thought or realization of what was happening. Initial discovery occurred upon Dr. ████████ falling dead mid-sentence as Dr. Dahij was absently clicking his pen near his desk. Dahij called his wife, only to discover no answer at any normally reachable locations, including her place of employment. Supervisor █████ was found dead with a mildly surprised look on his face. Pen was given SCP status, testing to follow shortly. The pen's action was confirmed by a reclusive Class-D personnel who only knew 39 living people, all met since his internment at location █████ █████ on base. Said personnel successfully dispatched upwards of 90% of the remaining test subjects on hand, as they had all been selected from the same dormitory wing on-base. Procedure for obtaining live testing personnel has been updated to require more randomization in the selection process. Addendum: Due to Dr. Dahij's recent personal tragedy involving nearly all of his friends and family, SCP-485 is hereby remanded to off-person custody in a locked safe-deposit box.